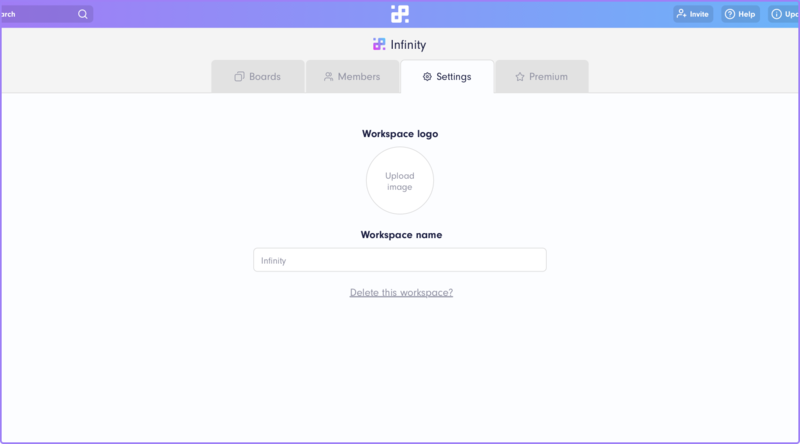 Once you sign up for infinity, the first thing you will need to get started is creating a workspace. A workspace is the highest-level unit of Infinity that encompasses all the projects you want to organize and all the information related to those projects. A single workspace consists of boards. Although you will start with one workspace, it’s possible to create more workspaces, each dedicated to a different set of projects. 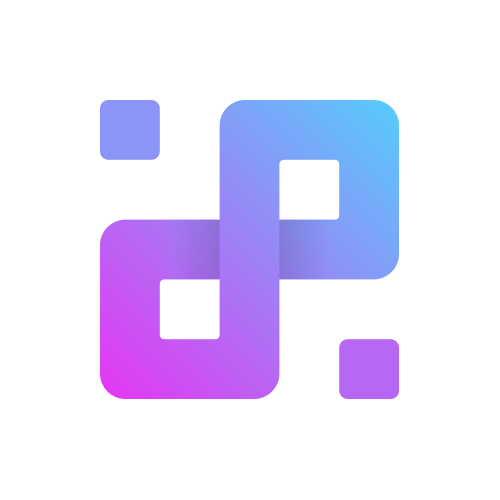 For example, if you’re a company owner, your workspace can be the name of your company, and the boards inside that workspace can be your company’s departments. Or, if you’re a freelancer, a workspace can include all your freelance work. And within that workspace, you will have different boards for different clients or projects. 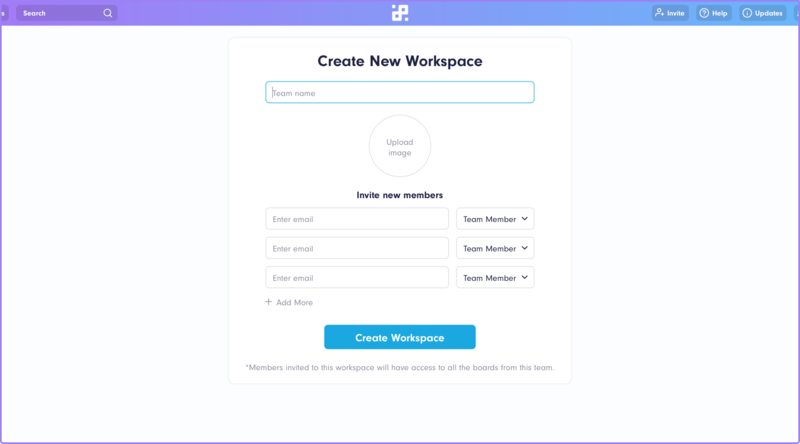 To kick things off more quickly, you will be able to create and name your first workspace during the sign-up process. 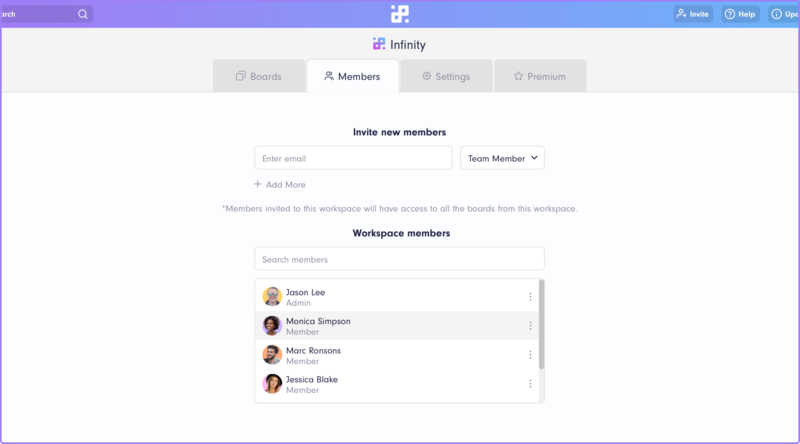 When you sign up (and each time you sign in again) you will land on your Infinity dashboard. 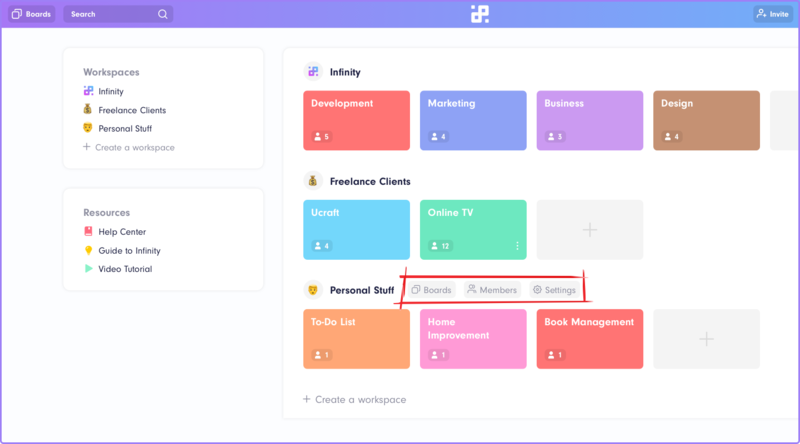 To create a new workspace, just click +Create New Workspace below your existing workspaces on the left-hand rail of your dashboard or at the bottom of the dashboard. When you’re done, just click the Create Workspace button and you’re all set. First and foremost, you will want to fill your workspace with boards. Add new boards by clicking the gray button with a plus sign that will always be placed right after the last board you created. Read more about creating a board in Boards section. You can further customize your workspace by hovering over the workspace you want to change. 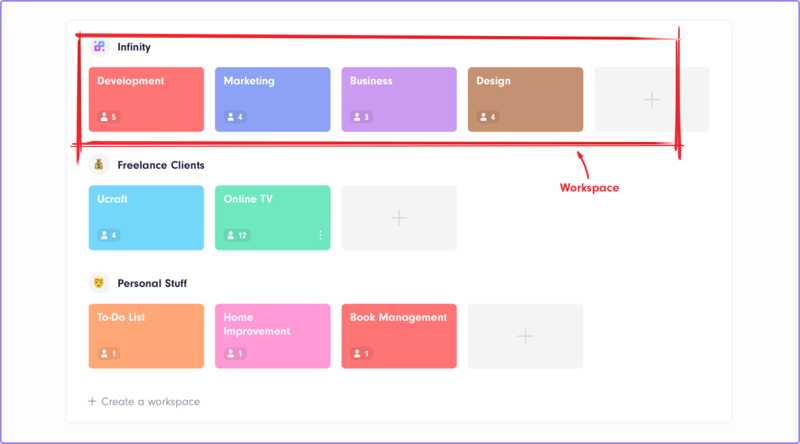 Next to your workspace’s name, three new options will appear: boards, team and settings. Once you click on each one of these, you will be taken to a new window. Here you will be able to change the photo representing your workspace and manipulate your boards, team and team name. 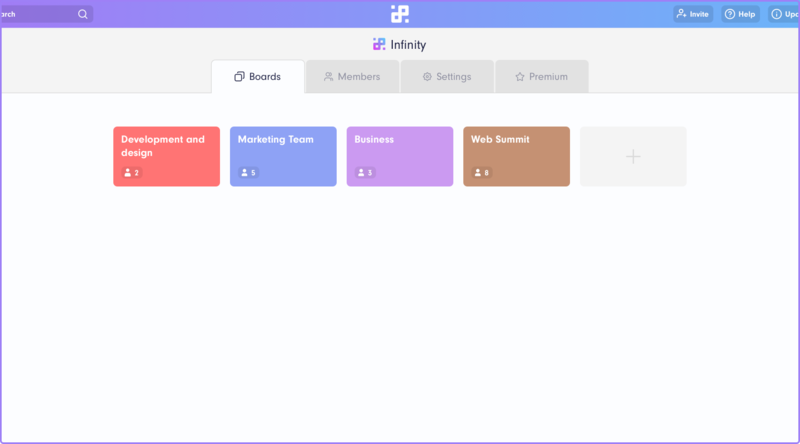 Clicking on Boards, you will get an overview of all your boards and an option to create a new one. In Settings, you will be able to update the name of your workspace but only if you have permission to do so, i.e. if you’re the owner or admin of the said workspace. And you will be able to delete your workspace here. Now that you’ve created and customized your workplace, it’s time to start organizing. Create your first boards and let’s get started!